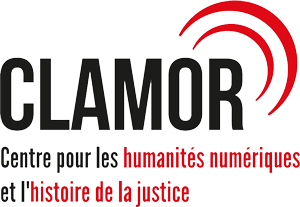 The CLAMOR can host interns, PhD students, postdocs, and other researchers to foster academic exchange and to facilitate the training and development of digital projects in the field of the History of Justice. The conditions of this sort of partnership are flexible and depend on the needs of the project and potential partners. For example, the CLAMOR can support funding applications to facilitate the realization of quality research projects. Feel free to contact us if you have such a project in mind. We would be happy to discuss the conditions of collaboration for the benefit of all parties involved.